Lednice Castle is part of the cultural and natural complex of Lednice - Valtice, which has been part of World Heritage by UNESCO since 1996. Both parts of the cultural and natural complex are connected by the so called Bezruè Avenue, which was built in 1715. Lednice Castle and the natural park is located in the South Moravian Region in the Czech Republic and the protected area extends over a total area of 283, 09 square kilometers. 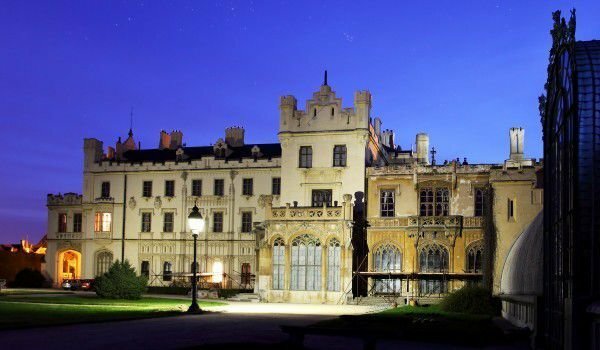 Lednice Castle and the complex are located in the eponymous town and is a brilliant Baroque complex designed by one of the best designers and architects. The palace ensemble consists of several parts, which lie in a beautiful park on the river Dyje, very near the town of Mikulov. During the 16th century the original Gothic castle was reconstructed and in its place appearred a beautiful baroque building. A little later the palace became the headquarters of the House of Liechtenstein, which remained in Lednice until the 19th century. To comply with the castle of their lineage Lednice Castle undergoes a number of improvements. The first floor was made suitable for living and now you can see there the prince apartment. The second floor was reserved for children, but nowadays it is made available for art galleries. This castle stands acquired as a result of the Neo-Gothic reconstruction between 1846 - 1858 year, which was led by the architect Georg Wingelmüller. Since the late 17th century until today they have managed to maintain school buildings and the baroque school of riding within the castle that were made by Johann Fischer. Within the eastern side of the mansion you can see the beautiful glass house that was built between the years of 1843 - 1845. Today Lednice Castle is an amazing architectural mixture between Gothic, Baroque and classical style. From the Baroque period the masonry stone has been reserved. The changes on the facade are rather impressive as are the pinnacles, galleries, places of observation, small towers and chimneys. Inside stays the interesting spiral staircase in the library and the wooden ceiling of the so-called, Blue Room and an additional charm is the decoration of ivory and marble. Interesting is the art exhibition within the caste that you can see today within the Museum of Agriculture, which offers a sight of a huge and unique head of the mammoth. In the final reconstruction of Lednice Castle in the late 19th century the beautiful park buildings were added, Temple of Apollo, Temple of the three Graces and others.